Worn by A-listers Angelina Jolie, Jessica Alba and Halle Berry (among others! ), Brit maternity brand Séraphine now has the royal seal of approval with a recent sighting of Kate Middleton wearing one of its dresses. Séraphine’s classic polka dot Renata wrap dress (right) is, as you would expect from the Duchess a flattering and elegant frock and as she has shown previously in her maternity style she likes a spotty dress – the Topshop number she chose became an instant hit thanks to the ‘Kate effect’. My sources tell me that the Duchess has been a fan of Séraphine throughout her pregnancy, ordering over a dozen dresses from the brand – I like to think she has the navy one I’m wearing (below, right) too, of course! – but this is the first time she has given a British maternity brand the royal stamp of approval in public. On a recent shopping trip in Peter Jones, Sloane Square, I happened to walk past the Duchess as she was just leaving the tills (she’s beautiful and very tall by the way!). Sadly I didn’t sneak a peek at what she had just purchased but as one of the London stockists of Séraphine I wonder if maybe it was that dress. It’s easy to see why Kate has stocked up on Séraphine‘s dresses; the supersoft jersey, classic colours and timeless styles flatter your bump and take you through the seasons during your pregnancy thanks to some great layering options also on offer. I was invited to select a dress from Séraphine‘s spring/summer collection so I chose this navy knot front dress. In my last pregnancy I went for a lot of body-con and stuck to my jeans so I’m experimenting more this time and thought this piece would be a great basic to dress up or down. This look was for a day at the office but would equally work for an evening or lunch out. Flats would dress it down for the school run or perhaps a picnic and if you need something smarter than a biker jacket, just swap for a tailored jacket. I’ve always loved combining black and navy and wearing leather alongside fluid jersey adds interest. Navy knot front dress, Séraphine; Leather biker jacket, H&M; White necklace, Dorothy Perkins; Black chain necklace, Wallis; Leather bag (the same as mine! ), Becksondergaard; Black patent courts, Hobbs. If you’re anything like me, pregnant or not it’s always fun to guess what’s in the bump. Is it a boy? Is it a girl? Well, with the royal baby it shouldn’t be too long before we find out but in the mean time why not partake in a little harmless guessing game! Séraphine are asking just that, with a two week tongue-in-cheek bus campaign running in central London right now through Regent’s Street and the Kensington area, and an online competition that invites you to guess the royal baby name. 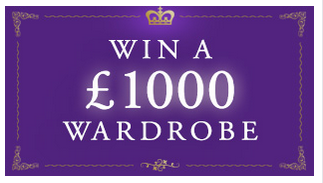 Get it right and you could win a £1000 maternity wardrobe worthy of a princess. Competition closes the day the royal baby arrives. Thank you to Séraphine for gifting me this gorgeous dress.